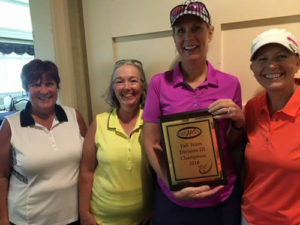 Lori Roberts believes one reason Hamilton Elks Country Club has enjoyed a recent run of success in Greater Cincinnati Women’s Golf Association events is softball. She and many of her teammates on the Elks played the sport growing up. “I really think it helps your hand-eye coordination.” Robert said. Roberts served as captain for the Elks team that pulled away from Kenwood Country Club to win the Division I-level championship of the five-event GCWGA Fall Team tournament. 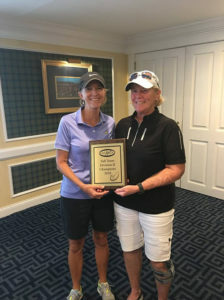 Miami View Golf Club, led by Diane Rottinghaus, took an early lead and held off TPC River’s Bend to squeeze out a two-point win in Division II. The Clovernook Country Club team captained by Ellen Shoemaker led Division III the entire way and came up with a five-point win over Stillmeadow Country Club, while Ivy Hills Country Club took advantage of playing the Division IV final round on its home course to match Hamilton Elks for the widest winning margin of the four divisions. 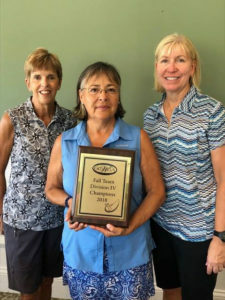 Hamilton Elks rode solid, consistent efforts from its team of Vicki Felver, Stacey Hinkle, Hilda Hodges, Sandy Roark and Tina Davis to the championship, matching the club’s Spring Team championship. The Elks team posted a nine-point win over Kenwood in Week Three at Wetherington Golf and Country Club to turn a 2.5-point lead into a 12.5-point bulge. Roberts believes Wetherington’s wide-open fairways played to the strengths of her team. “We’re just a bunch of girls who like to play golf,” Roberts said. Ivy Hills Division IV: Carole Hastings, Linda Leigh Ross, Diana Oberschmidt. Also playing in the final match but not pictured was Judy Frey. 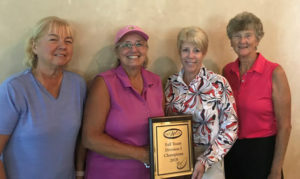 The Ivy Hills team of Oberschmidt, Denise Meismer, Linda Leigh Ross, Carole Hastings, Connie Toole and Nicky Wolff led Maketewah Country Club by one point going into the final round at Ivy Hills, where they rolled to a 12-point win. “I think you can say we were pretty confident going into the final round,” Oberschmidt said with a smile. “I think most golfers are more comfortable on their home course.” Ivy Hills was bolstered by the play of Toole, Oberschmidt said. “Her game really came together,” the captain said. Clovernook Division III: Cindy Valerius, Mary Pat Lienhart, Ellen Shoemaker, Kristy Herbort. The Miami View team opened up a 7.5-point lead in Week Two and nursed it through dropping the Week Three and Week Four events to the final. The roster included Kathy Dinkelacker, Debbie Driehaus, Barb Schneider, Lynn Torbeck, Kim Bollinger, Linda Steinriede, Karen Smith, Mary Hanak, Debbie Brennan, Diane Sundrip and Jan Humpert. Clovernook held a 10.5-point lead through Week III before finishing six points behind Stillmeadow in Week Four and getting back on track with a 7.5-point win in Week Five. Shoemaker’s roster consisted of Mary Pat Lienhart, Kristy Herbort, Diana Hodapp, Cindy Valerius, Deanna Ashing, Julie Inman, Karen Mihovk, Karen Campbell, Betty Chriest, JoEllen Nieman, Paulette Homer, Jan Schmid and Patricia Krumdieck.